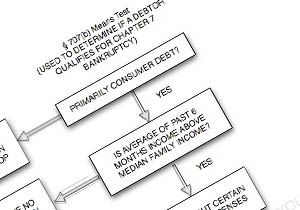 Following the changes to the Bankruptcy Code in 2005, an income test (known as the “means test”) is applied to all debtors. This financial formula determines if you qualify for a Chapter 7 filing, or if you will be required to file a Chapter 7 bankruptcy. While there are many components to the calculation, there is a median income level based on your household size and where you live in New Hampshire. If your income is less than this median income for your household size, you typically qualify for Chapter 7 bankruptcy. Even if your income is above the median income, you may still be able to qualify for Chapter 7 bankruptcy. If your income is greater than this median income for your household size and you are unable to overcome the presumption that you should not be allowed to file a Chapter 7, than you may qualify to file a Chapter 13 bankruptcy. This will allow you to establish a repayment plan and most likely discharge much of your unsecured debt. There are certain deductions that can be applied to your income to help you meet the means test. Some of these deductions include your mortgage payments, car loan payments, and past due taxes. Even though the means test may seem simple enough, having a professional bankruptcy attorney prepare the calculation is critical when you are considering bankruptcy. You do not want to commence a Chapter 7 proceeding only to be told that you have to be in a Chapter 13 bankruptcy. Attorney Kelley will prepare the means test calculation and insure that you understand all of your options before you decide to file for bankruptcy. Knowing where you stand with the means test is the first step toward taking control of your finances and getting the second chance you need.